WAT: You’ll Never Know until You Experience It Yourself! There was talk of dreams, a clash of realities, and heartfelt summer memories. 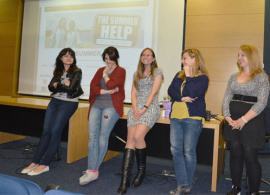 All that and more emerged during a rough-cut screening of “The Summer Help,” the latest documentary film project of AUBG professor Melody Gilbert. 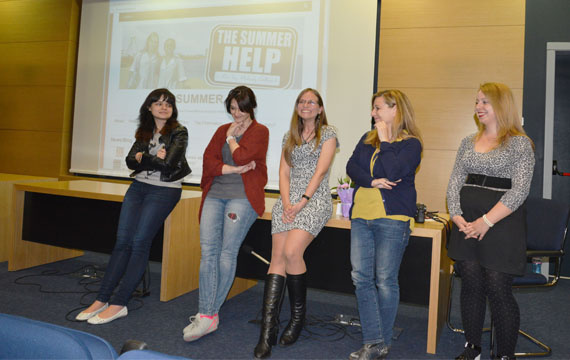 The film, nearly three years in the making, chronicles the annual migration of students from Bulgaria to the United States for “Work and Travel.” The students’ goal: to earn enough money working summer jobs to help pay for their education at the American University in Bulgaria. The movie tells the story of two best friends – AUBG students Nikoleta Gancheva and Elena Ivanova -- who travel to Myrtle Beach, S.C., after their freshman year to work. We see them first in their homes, saying goodbye to their families and then we get transported to South Carolina where they both work at a local hotel as housekeepers. The hour-long documentary reveals their initial reactions to the new place, to the environment, to the people, to the food. It shows the problems that they face and how they deal with them. Meanwhile a parallel to Bulgaria is drawn where both girls’ families are going through a rough time. Gilbert also incorporates footage of other AUBG students doing the same program, but in other places such as Martha’s Vineyard and Provincetown, all located in Massachusetts. The main idea behind the movie itself is to prove that as the logline says: “You don’t know who’s doing the dirty work.” How it’s a trend for bright students from Eastern Europe to travel to the U.S. There they work long hours for minimal wages and in order to finance their education. The two main characters, now graduating seniors, were present at the screening. Both said that they were touched by the documentary. “It made me remember many things, it made me think, it made me realize how much I’ve changed over the years,” Gancheva said. Three years later, both are still planning to spend one more year doing WAT. Early in the film, Ivanova said she didn’t like the U.S., but now she is going back for her fourth year. Gancheva, who after her summer the South Carolina spent the following summers in Spain and Greece, is preparing to go to Mallorca, Spain. Throughout the movie, the audience reacted to every moment – nobody left the room indifferent to what they had just seen. At the end of the screening in the Balkanski Academic Center theater, audience members shared their opinions and Gilbert gathered additional information about how she could improve the movie. The screening of the final version of the doc is yet to come.